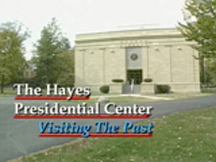 The Hayes Presidential Center: Revisiting The Past" documentary explores the 25-acre Spiegel Grove estate which also includes a tour of President Hayes' 31-room Victorian home, the tombs of the President and his wife Lucy, a carriage house, hiking trails, gardens, library, gift shop, and other historical sites. Many historical furnishings, paintings, and books are explored in the special. Some of these include: a portrait of Lucy in her wedding dress, Lucy's sewing machine, Victorian era toys, dressing tables, and much more..